Having a video capturing system in place means you won't ever wonder what happened. You'll know for sure and you can prove it! 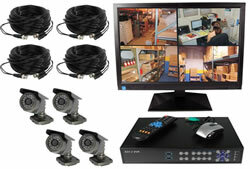 Finding the right surveillance system for home or for a business can be very frustrating...starting with the question of "what type of security cameras do you need" to "how do you record the video" to "what cables and components are needed to make it all work?" We understand! Something as complicated as a surveillance system can be daunting. But we've eliminated all of that for you and put together complete packages that have everything you need. You don't need to worry about the little things because all of that has been thought out for you...even down to the cable and connectors.